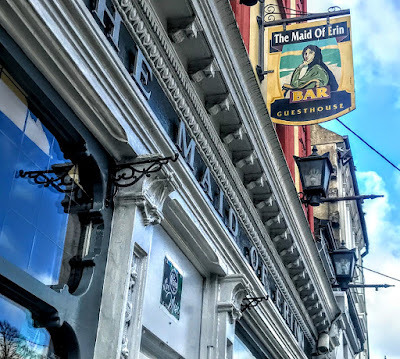 Patrick Comerford: Should the Maid of Erin in Tipperary look like Hibernia or look like Lady Lavery? or look like Lady Lavery? Tipperary Town wears its strong nationalist past on every sleeve. Street names commemorate Thomas Davis and Charles Kickham, plaques recall John O’Leary and his sister Ellen, and a seated Charles Kickham seems to preside in bronze over the town from his throne on a plinth at the top of Kickham Street, facing onto Main Street. 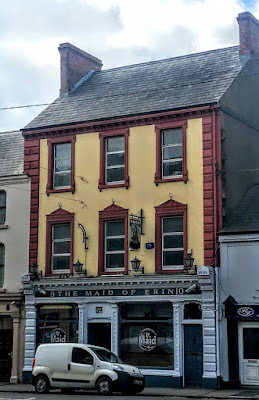 But the most unusual reminder of nationalist sentiment in Tipperary is the ‘Maid of Erin,’ on the corner of Church Street and Main Street. The monument once stood proudly on a pedestal at the end of Main Street, but was moved to its present place in a railed, pebble-dashed alcove on the corner of Main Street and Church Street in 2003 after it had been struck once too often by a passing truck. 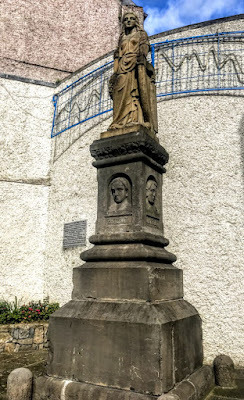 The Maid of Erin was unveiled in 1907 to commemorate the so-called ‘Manchester Martyrs,’ three Fenians who were executed in Manchester 40 years earlier. The ‘Manchester Martyrs’ were William Philip Allen (18), who was born near Tipperary but grew up in Bandon, Co Cork, Michael Larkin (32), from Banagher, Co Offaly, and Michael (Gould) O’Brien (31), from Ballymacoda, Co Cork. The three were executed for the murder of a police officer in Manchester on 18 September 1867. They were among a group of 30 to 40 Fenians who attacked a police van taking two arrested leaders of the Irish Republican Brotherhood, Thomas J Kelly and Timothy Deasy, to prison. Sergeant Charles Brett was shot dead in the attack, Kelly and Deasy were released and were never recaptured. Allen, Larkin and O’Brien were hanged in front of about 10,000 people at the New Bailey in Salford on 23 November 1867. Monuments to their memory were commissioned in Manchester and Tralee, Co Kerry, Limerick, Kilrush and Ennis Co Clare, Birr, Co Offaly, Milltown Cemetery, Belfast, Ladysbridge, Co Cork, near O’Brien’s birthplace, Glasnevin Cemetery in Dublin, and in Clonmel and Tipperary Town, Co Tipperary. The monument in Tipperary Town on a prominent corner site is a landmark sculpture. It shows a carved limestone female figure standing on a base with portraits of the three executed men, and a pedestal with a stepped plinth, and with dressed limestone bollards at corners. The portraits have the names of each man in Irish. It is a naturalistic and evocative piece of work, made all the more striking by the life-like portraits of the executed men. The female figure, the ‘Maid of Erin,’ was seen at the time as the personification of Hibernia or Mother Ireland. But in popular culture, at a time when Irish identity was inter-twined with Catholicism, her image was fused with the Virgin Mary. The statue was commissioned by the Tipperary branch of the Irish National Foresters. The monument was designed by PR Cleary of Tipperary and was completed by Joseph O’Reilly in Dublin. It was unveiled on 10 March 1907 by Charles Doran of Cobh, a long-standing Fenian activist. It stood on its original site until July 1992. It was moved to its present location in February 2002 and was officially unveiled for a second time on 22 June 2003 by the Mayor of Tipperary, Anna Tuohy-Halligan. The monument now stands a stone flagged pavement behind wrought-iron railings, with an information board and rubble stone planters beside it. Behind the monument, the walls of the neighbouring buildings provide painted roughcast rendered screens. This site had been vacant since the night of 13 November 1920, when two houses, including the home of the Sinn Fein TD for Tipperary South, Patrick James Moloney (1869-1947), a pharmacist from Limerick, were burned down in an unofficial reprisal after several soldiers were killed in an ambush in the Glen of Aherlow. The site was donated to the people of Tipperary by Thomas Moloney of Ballinahow, Tipperary. 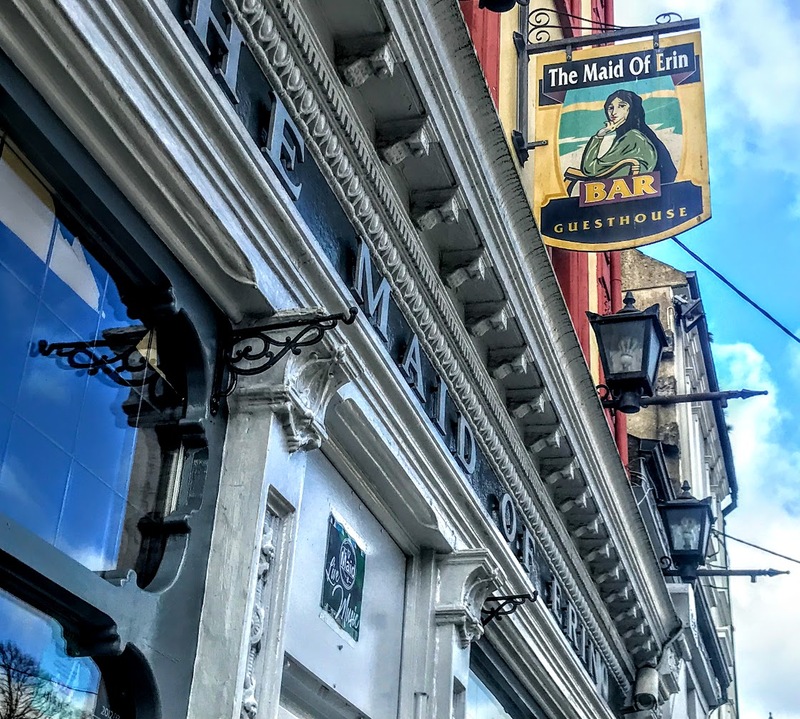 The Maid of Erin is also the name of a traditional pub around the corner at No 9 and No 10 Church Street. Although this public house takes it name from the memorial, it predates the statue and was built ca 1880. The pub is notable for its highly ornate shopfront, displaying fine craftsmanship in render and carved timber. The scalloped timber frames on the ground floor windows and in the mouldings of the consoles and strongly presented pilasters are excellent examples of high-quality work. This is a terraced, three-bay, three-storey house, with an elaborate timber-and-render shopfront on the ground floor with a moulded bracketed cornice, dentils, egg-and-dart course, elaborate consoles, channelled quoin pilasters, some quoins vermiculated and a painted rendered plinth. There are scalloped frames on the over-lights above the shop door and one side of the other door is flanked by decorative panelled pilasters with decorative capitals. Here too there is another image of the ‘Maid of Erin.’ But this time she looks less like Hibernia, or even the Virgin Mary, and more like the portrait of Lady Lavery that decorated pre-Euro Irish banknotes. For the ‘Maid of Erin’ in Listowel, Co Kerry, visit HERE.